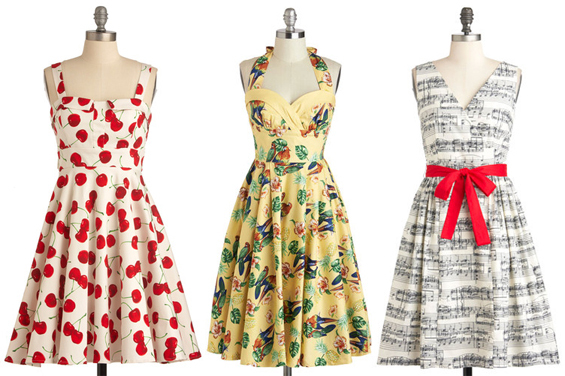 Plus Size Picks - Novelty Print Dresses from Modcloth - Sugar, Darling? 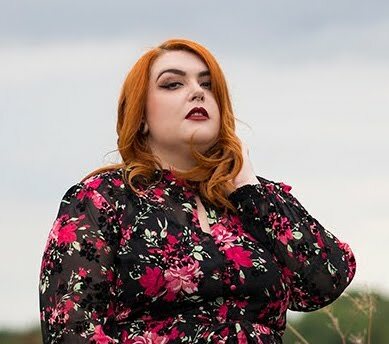 I've been really happy to see that US based online store Modcloth have been concentrating on building up their plus size selection over the last year or so as their stylists and buyers have a great eye for unusual and eye catching garments that you would rarely see in larger sizes. 1 - Enchanted Afternoon Dress - I love love love blue floral prints, mainly because I think hues go really well with my super light blonde hair but also I think because they make me think of my Gran's china plates! This one is to die for with a richly pigmented print and wide belt to give you some killer curves. Sweetheart necklines are my favourite too so this one really is a winner in my books! 2 - Aroma for Improvement Dress - I'm a sucker for Victorian style illustration prints and the fact that this one is of perfume atomisers just makes it even better! The wrapover style of the top is always very flattering to a fuller figure and again there is a belt for some added waistline help. 3 - Scene and Believed Dress - Now this really is a novelty print! Stunning Summertime lanscapes full of cherry blossom and green green grass? Perfection! The circle skirt and little collar are mega adorable too, and that little bow at the waist. I think you'll be hard pushed to find a cuter dress! 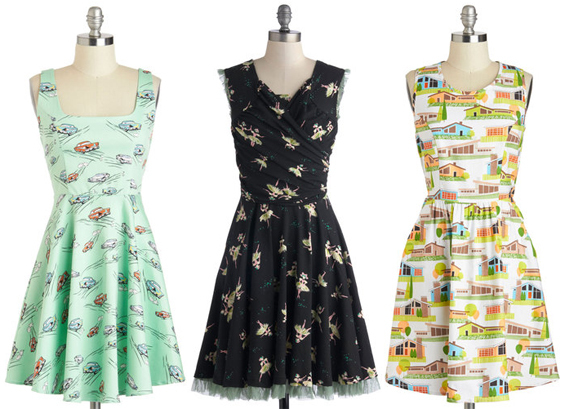 4 - Driven to Dazzle Dress - I already own two retro car print dresses but I just can't get enough of them, they're so kitsch and fun! This one is a lovely shade of mint green and has a nice squared off neckline which you don't see all that often. 5 - Tendu You Dance? Dress - What a lovely little party dress! The frills at the sleeves and skirt bottom are just delightful and work perfectly with the ballerina print! Again a wrapover top would work here to be very flattering and it even features a little modesty panel to make it less bust-a-rific if you worry about such things. 6 - The Lady Brunch Dress - This print really reminds me of the houses in Edward Scissorhands! Again it's a super kitsch design with a nice round neckline. I would definitely rock a beehive if I was wearing this little number! 7 - Pull Up a Cherry Dress - I love a good cherry print but you rarely see it in a large scale design, I think it works much better at this size and gives a bold cutesy statement! I love the thick straps and foldover detail at the bust line on this one, it would be ideal for a picnic or barbecue. 8 - Catamaran Candescence Dress - Terrifically tropical with pretty parrots and leaves! I love the pale yellow colour, unfortunately this shade just doesn't suit me but I think it looks fab on brunettes. It had a dreamy neckline and halter straps and the circle skirt looks just the right length! You can see lovely Kaelah wearing it here. 9 - In The Key of Chic Dress - I don't know why but I think this would be a wonderful dress for Christmas, maybe because it makes me think of singing carols around a piano - I may be crazy, do forgive me! The bold red ribbon belt looks just like a pretty parcel bow too. I think I may have to make it my festive dress this year! 10 - Perfect Perennial Dress - This is a really classic shape and print that I just adore, so feminine and glamorous. I can just picture Dita Von Teese hosting a drinks party at her place in this dress, perfectly done up with her jet black hair and red lips! I don't think I could be quite that glam-tastic but I could give it a good go in this! 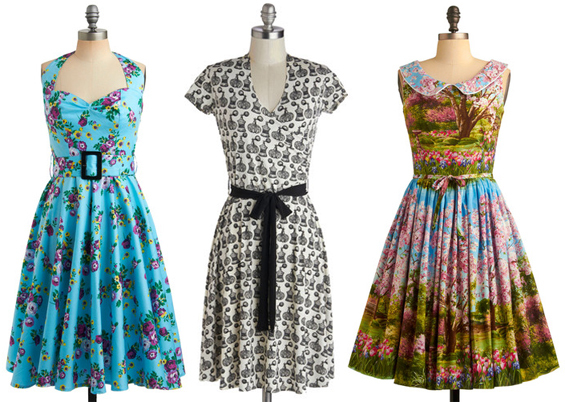 11 - Floral Field Day Dress - Another classic style, this one more suited to day wear. Beautiful sage green works wonderfully with orange and mustard yellow ditsy flowers and shiny buttons. The collar is a great shape and the slightly puffed sleeves are just darling! 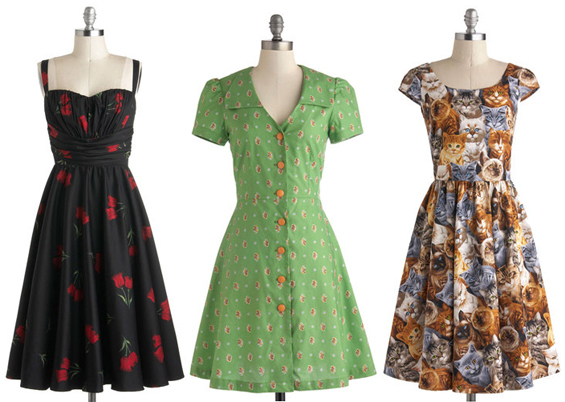 12 - Hooked On a Feline Dress - Last but not least, a spectacularly crazy kitty cat print number! It reminds me of a classied up version of those cat fleece sweaters that old ladies wear, in a good way!!! Again a timeless shape that flatters most figures and could be dressed up with heels or dressed down with a good cardigan.